Armour exhibited regularly at the Royal Academy in London; the Royal Scottish Academy in Edinburgh and winning the Guthrie Prize in 1937; the Royal Society of Painters in Watercolour, the Scottish Society of Artists and the Royal Glasgow Institute of the Fine Arts. 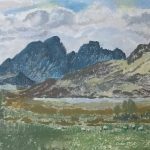 In 1941, she was elected an associate of the Royal Scottish Watercolour Society, becoming a full member in 1956, She became a member of the Royal Scottish Academy in 1958. In 1927 she married the artist William Armour (1903–1979) at this time her marriage resulted in her resigning her teaching post as required under the education authority rules for married women However after the Education Authority legislation for married women had been repealed, Armour returned to teaching still life painting at Glasgow School of Art from 1951 to 1962. She retired from teaching in 1962 and returned to painting full-time. This allowed a late flourish in her career and her work was in considerable demand. In 1972 she was awarded the Cargill Prize from the Royal Glasgow Institute of the Fine Arts and became a full member of the Institute in 1977. In 1982 she was awarded an honorary LLD from the University of Glasgow. She was also elected Honorary President of both Glasgow School of Art and Royal Glasgow Institute of the Fine Arts. The Armour Award, named after her, is awarded annually by The Royal Glasgow Institute of the Fine Arts for a work of distinction by a young artist.